See Tru-Stride Stilts in action - Please Click Here to view our youtube.com video. Patented two-piece foot plate provides "ankle" function with a heel to toe movement that translates into a smooth, natural stride. The heel and toe plates provide greater stability since one pad is in full contact with the ground at all times. When legs of the stilt are extended, all the advantages of the Tru-Stride ankle function with heel to toe movement increase proportionately. The greater the height, the greater the advantage! The Tru-Stride Stilts has a patented two piece foot plate which provides an “ankle” with heel to toe movement that translates into a smooth, natural stride, as well as other functional advantages for a safe and easy alternative to cumbersome traditional stilts. 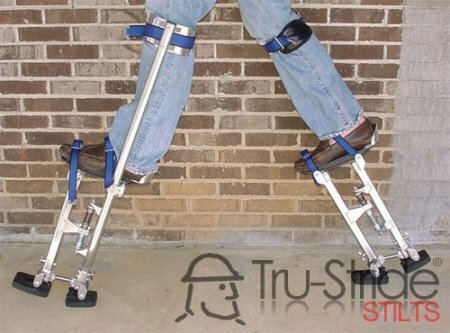 The Tru-Stride Stilts is a revolutionary stride in stilts technology. The Tru-Stride Stilts heel and toe plates provide much greater stability since one plate is in full contact with the ground at all times. The natural walking motion uses less energy and greatly reduces the lifting of the stilt necessary to walk. It also allows walking uphill and downhill and on stairs, as well as providing greater stability walking on uneven surfaces and ground clutter. Further, there are no rotational forces transferred to the calf like on traditional one-piece floor pads, so there is less pressure on the calf allowing longer pain-free work periods. The lack of rotational forces also allows for quick stops and starts. When the legs of the stilt are extended, all the advantages of the Tru-Stride ankle function with heel to toe movement increase proportionately meaning the greater the height, the greater the advantage.